So, this past Saturday, around 8pm, a last-minute dinner visit from my in-laws was scheduled… for 4pm yesterday. Now, I had just gone to the grocery store, so my kitchen was well-stocked; additionally, cooking for people doesn’t really frazzle me, so I wasn’t too concerned. However, I DID need to come up with a thing or two to fancy up a typical dinner for my husband and I, so I decided to bake some bread. The recipe I decided to use is one I’ve used dozens and dozens of times, and it. is. awesome. It creates the most beautiful, brown, crusty loaf of bread you’ve ever seen – and the interior is moist and flavorful and delicious. I promise you, I could eat an entire loaf of this bread myself, simply slathered with some butter – it is that good. The best part of this recipe? It is CRAZY EASY, requires very little active work, and the end result is terribly impressive. This recipe was originally published in the New York Times in 2006. I found it via another blog shortly after the article was published, but I really couldn’t tell you what blog or when or where. Per usual, my version is ever-so-slightly different. One thing to note about this recipe: the dough needs to rise OVERNIGHT. So, if you want to make it, you just have to remember to take 45 seconds to mix the dough the night before you want to have it, and you’re golden. – a heavy dutch oven, with a tight-fitting lid (cast iron or enameled cast iron are preferred – glass will work, but I’d recommend NOT using any non-vintage pyrex, as there have been a frightening number of incidents reported in recent years involving newer pyrex dishes exploding and seriously injuring people. This recipe calls for a very high temp oven, so I wouldn’t feel safe using glass/pyrex, personally. You can see reports of these explosions here and a short video about it here). 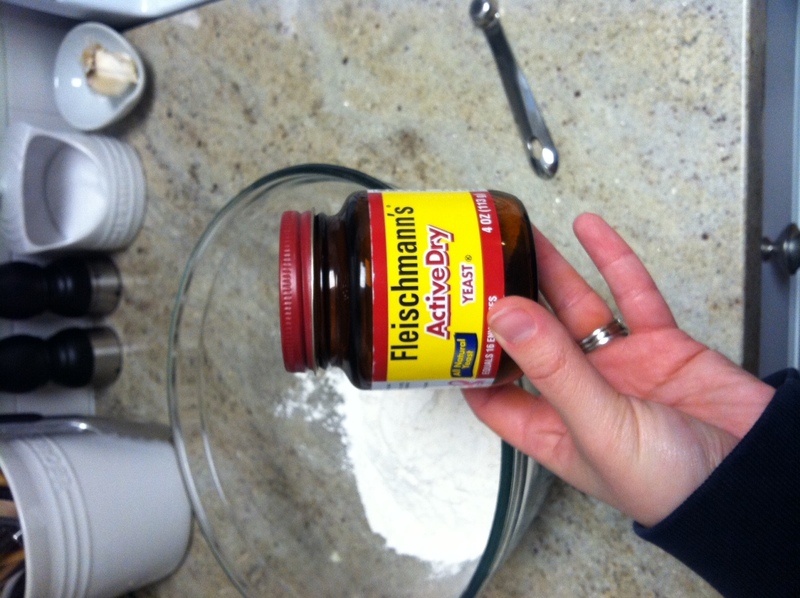 – Active Dry Yeast (NOT instant yeast or bread machine yeast). You can buy the little packets, or a jar. I find the packets to be irritating, as the vast majority of recipes DON’T call for the exact amount in one packet, so I just buy a jar, write the date on the lid, and store it in the fridge once it’s opened (discard after 6 months). 1.) In a large mixing bowl, whisk together your flour, salt, and yeast. Add the water and stir together until a sticky, shaggy dough has formed. For this, I like to use a bamboo spoon with a wide, flat end on it – I scrape the floury bits off the sides of the bowl as I go, and I press the dough together with the back of the spoon, helping to evenly hydrate all the ingredients. It should take about a minute or two, just until all the ingredients are evenly incorporated together. 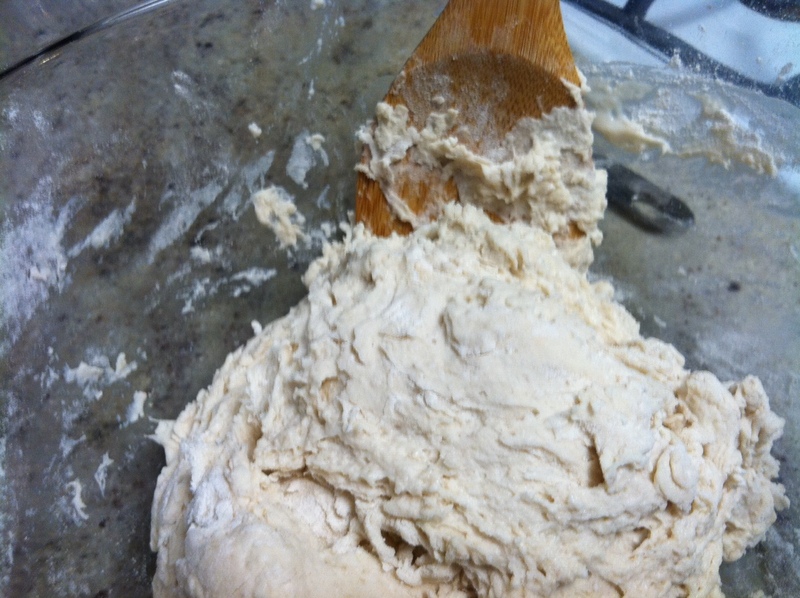 The dough after mixing, ready to rise. 2.) Cover the bowl with plastic wrap, and set aside to rise overnight. I like to put my bowl in the (unheated) oven, to prevent any drafts from chilling it. 3.) I typically let my dough rise about 12 hours, but you can let it go as long as 18 hours. 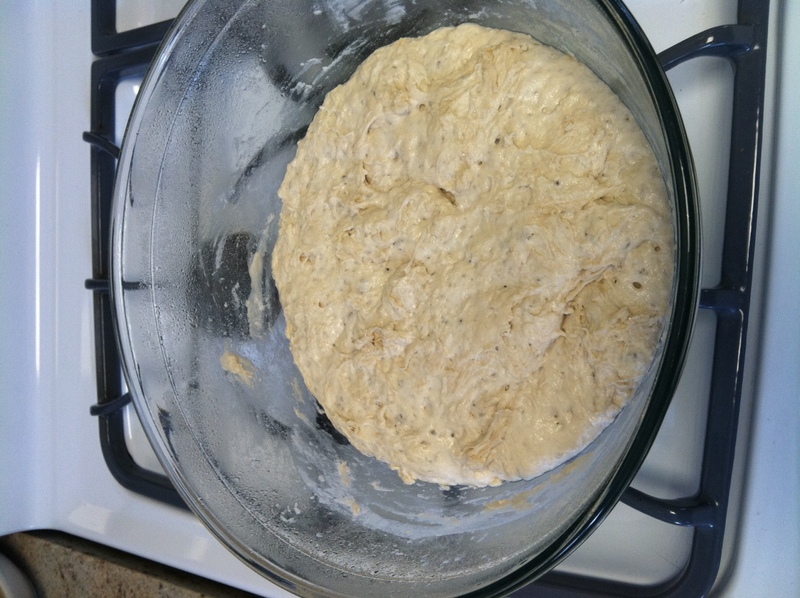 When the surface of the dough is dotted with large bubbles (see below), it is ready to go! 4.) Lightly flour your countertop, and then remove the dough from the bowl. It will have a very sticky consistency, and will stick to the sides of the bowl of a bit – like a giant wad of gooey gum. Just drag your hand around the edges of the bowl to release the dough, and you should be able to get the bulk of it out of the bowl easily. 5.) 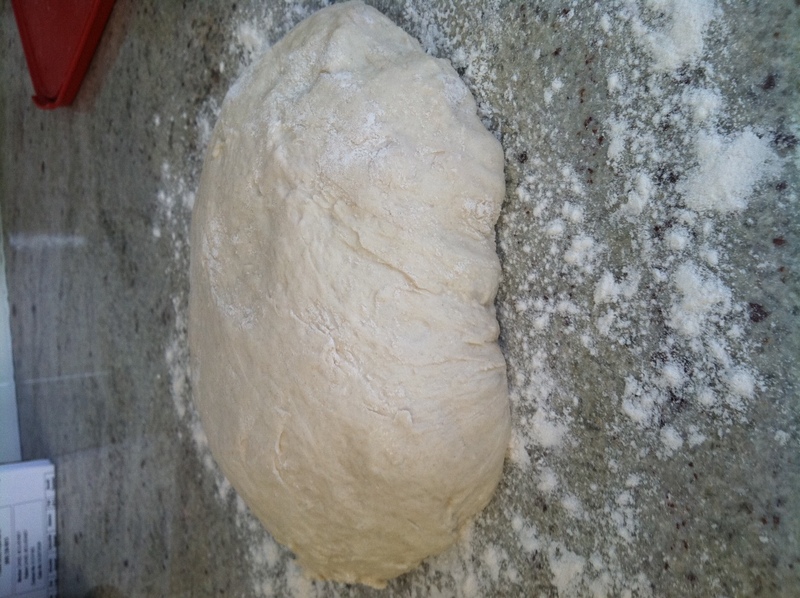 Place the dough on the floured countertop, and fold it onto itself just a couple times, to press the air out. Cover the dough with your plastic wrap, and allow it to rest for 15 minutes. 6.) When the dough has rested, it’s time to form it into a ball. Sprinkle a small amount of flour onto the top of the dough, and then work it into a ball with your hands (basically, you want to sort of gently tug the sides of the dough and tuck them under the ball of dough – the top and sides will look smooth, and the bottom will be kind of rough. I hope that makes some sense). This should take only about a minute – lightly dust flour onto the dough as you go, if needed, to keep it from sticking to your hands – you shouldn’t need much at all. 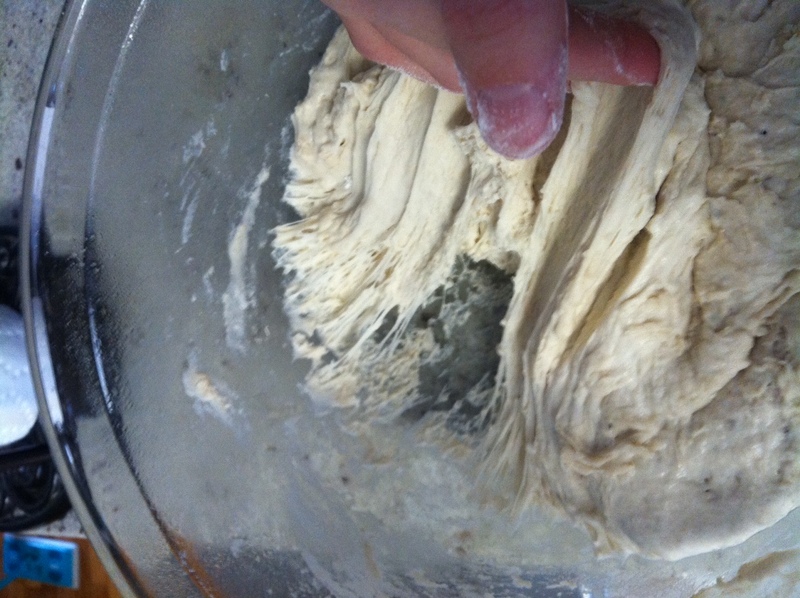 At this point, the dough will still likely be a little… loose. It won’t be a stiff ball of dough – when you set it down in the counter, it’ll likely spread a little and lose it’s shape a bit – that’s okay. Shaped into a fairly smooth ball/blob. 7.) Once your dough has been shaped into a ball, lay a smooth, clean, cotton dishtowel down on the counter and dust it with a bit of flour. Place the dough (smooth side up) onto the towel. 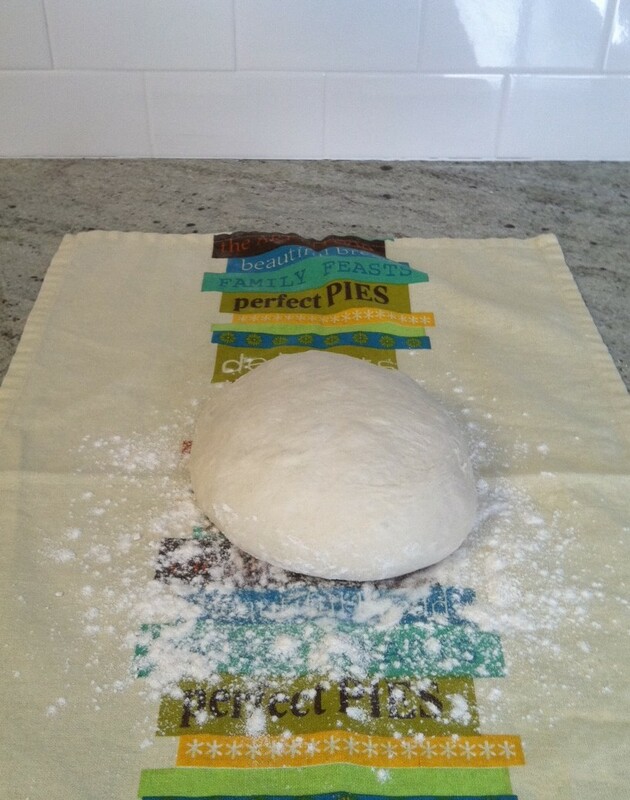 Dust a bit of flour onto the top of the dough, and then cover it with another smooth, clean, cotton towel. 8.) Let the dough rise for 1-2 hours, until it is about doubled in size, and if you poke it with your finger, it DOESN’T immediately bounce back. 9.) About 30 minutes before the dough is ready, preheat your oven to 475°, with your dutch oven (with the lid on) inside. One small tip – if your pot has a plastic knob on the lid, wrap the knob in foil to keep it from potentially melting. 10.) When the oven and dutch oven are good and preheated, carefully remove your pot from the oven, and remove the lid. 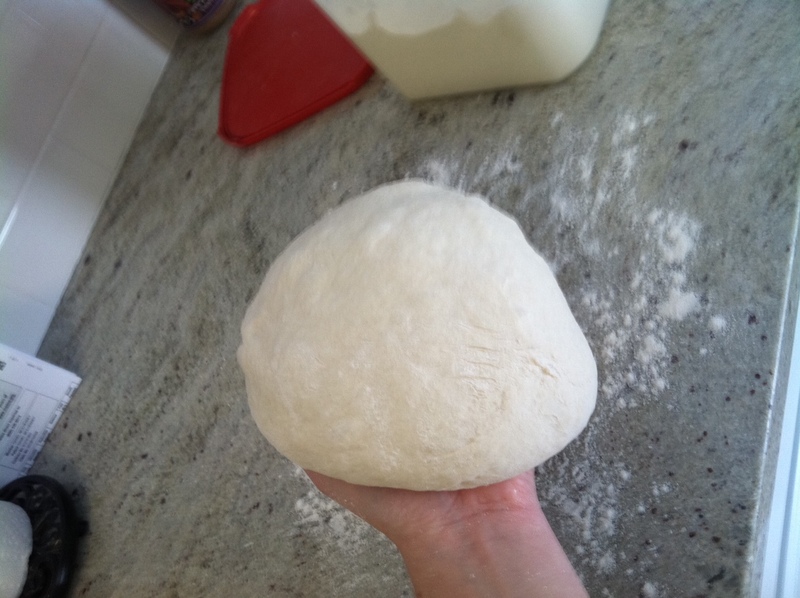 Slide your hand under the ball of dough, and flip it over into the pot (so the smooth side is down). Carefully put the lid back on, and put the whole thing in the oven. 11.) Bake for 25 minutes with the lid on. After 25 minutes, remove the lid, and bake for another 10-12 minutes until the crust has turned deep golden brown. 12.) Remove the pot from the oven, and then carefully remove the bread from the pot – I typically keep one hand in an oven mitt, and then use a flexible spatula (like a fish spatula) to slide up under the loaf, and help lift it out. Place the bread on a cooling rack (or just on the grates of your stove) to cool – anywhere that air can circulate around the entire loaf. 13.) Allow the bread to cool for at least 1 hour before cutting into it. And that’s it! I know it SEEMS like a lot of steps – but once you’ve baked this bread one or two times, you’ll realize how simple it really is. It basically takes about 4 minutes of active work, and a whole bunch of waiting – but you get a beautiful, delicious loaf of bread in the end! Perfect for sandwiches, making croutons, dipping into olive oil, or just straight up devouring as is. One kind of interesting thing about bread like this – when it first comes out of the oven and starts to cool, it makes all these crazy crackling noises as the cold air hits it and the crust expands and settles. It literally kind of sounds like a crackling fire as it happens. For whatever reason, I find this to be impossibly cool, so I took a short video of it happening (yeah, that’s right, I FILMED A LOAF OF BREAD. Judge me if you must)! HOWEVER, it appears that we cannot embed videos in this here blog, so I guess I can’t share it with you. 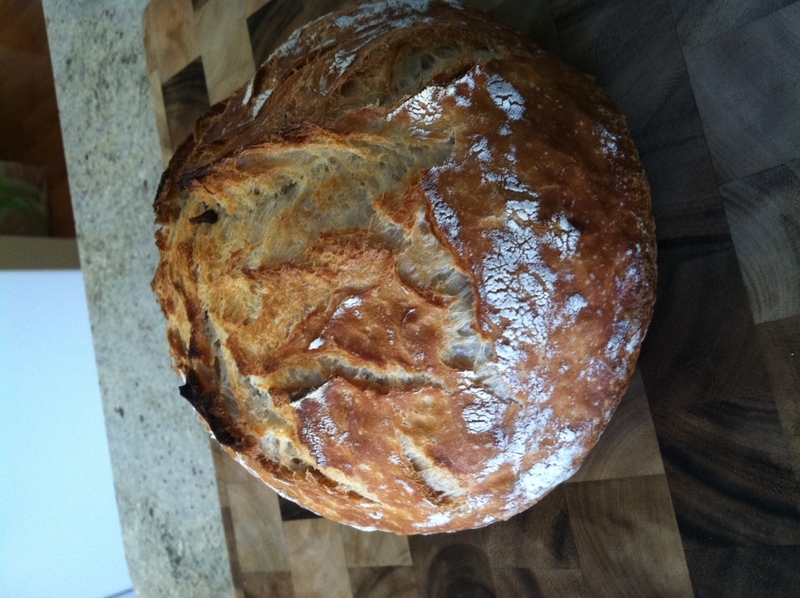 If you are absolutely dying to see the video of my bread, just leave a comment saying that and I’ll email it to you. i need the video. and i am making this bread this weekend. This is a great recipe. Lots of possibilities of adding additional ingredients such as rosemarie or olives to change the flavor of the bread. 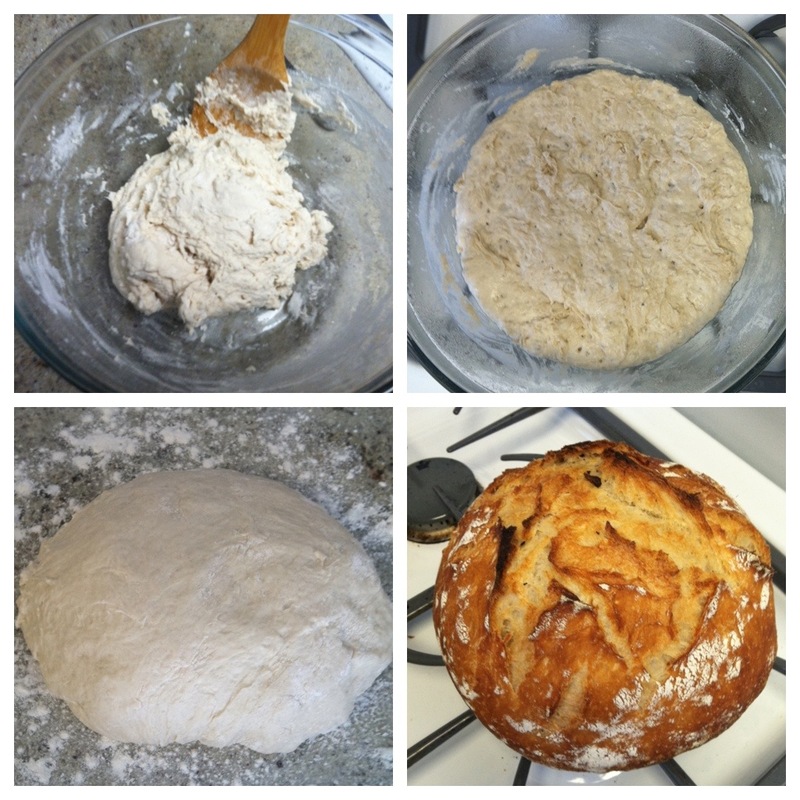 Just made this bread today (12/31/12) and it is AMAZING! Thank you!! Please send your video of crackling bread.